These kind, sympathetic people easily sacrifice their interests for the sake of others. They are few-sided, cautious, often silent about their problems, but always find time for close friends. According to the combined horoscope Libra-Dogs — born diplomats: soft, compliant, people inclined to compromise. Intelligent, courteous and attentive to others. They are able to find an approach to each person, and they have no equal in terms of reconciling the warring sides. 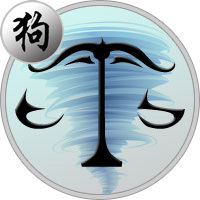 True, the restless, trying to find inner balance Libra brings chaos and confusion to the lives of people of this sign. Sometimes Libra-Dog is so emotionally affected that it surprises the surrounding people with its indecision or makes rash acts. Benevolent Dog-Libra is respectful to others. They do not have excessive curiosity, rudeness and tactless behavior. They try not to interfere in the affairs of strangers and resolutely suppress any encroachment on their independence. The main feature of the Libra-Dog sign is honesty, impartiality. Demonstrates high demands on himself and his closest circle — he is merciless to vice. At the same time, he is responsive and disinterested: he is always ready to help and support, regardless of any circumstances. Despite his intelligence and discretion, Libra-Dog is often a victim of deceivers. However, the persistence and endurance inherent in the Dog, help him with honor to come out of any unpleasant situation. The vigilant Libra-Dog is able to recognize the impending danger, even if nothing around indicates this. Completely trusts only himself, prefers to work alone. However, he is sociable, easily comes into contact, therefore he is considered pleasant in every respect by man. Libra-Dog can find a common language with a variety of people, quickly understands how to behave better in this situation. Does not differ stubbornness, will not insist on his: soft and pleasant in communication. But it’s pretty hard to defend your point of view. It is quite capable of firing and starting a quarrel, if it concerns matters of principle for him. It is straightforward, a bit naive, does not tolerate lies, mercilessly fights against intriguers and deceivers. Practical Libra-Dogs are not inclined to frivolous spending: they clearly plan their expenses. These unpretentious people are ready to be satisfied with small things. Full of inner dignity, with great respect for the desires of others. Are ready to accept any choice of a close person, they will not discourage and insist on their opinion. Quite soberly assess their capabilities, do not undertake a job that they can not afford. However, Libra-Dog is subject to doubt, not always confident in their abilities. Sometimes he overestimates himself and brings others around, but he sincerely repents and tries to smooth an embarrassing situation. Needs participation and good advice: it can become better if there is a reliable person close to you who knows life. Men and women Libra-Dogs are externally attractive and pleasant people in communication. Always at the center of everyone’s attention, although they do not at all like to like everyone without exception. They behave with great dignity: polite, courteous, but no more. Above all, they value their freedom. On a love horoscope, Libra-Dog — a capricious partner with inflated demands on his half. He is looking for a reliable and loyal partner in life, he does not intend to waste his time on questionable acquaintances. Libra-Dog strives for a harmonious relationship. With all his strength he tries to avoid quarrels and conflicts, tries to reach an understanding with his half. For him, much more important than spiritual comfort, than material prosperity. He is respectful and attentive to his partner, waiting for such an attitude to himself. The Libra-Dog is a good family man. It is easy to make concessions, with him you can agree on everything in the world. However, will not allow you to manipulate your feelings, do not tolerate scenes of jealousy. For the Libra-Dog, work is an important part of life, but not the meaning of existence. Although able to build a brilliant career, has a lot of virtues: dedication, honesty, diligence. Libra-Dog can handle money, it suits work related to finance. At the same time, he is not fixated on material goods, he treats money calmly. I am willing to work in low-paid jobs if I see the prospects for further growth. With such a reliable partner, you can start any business safely — it will not fail and will not deceive. Libra-Dog is susceptible to doubts: how useful and useful to society is his work. Needs competent leadership: can take place in any profession, if he meets a wise mentor. Not susceptible to criticism, does not like to follow instructions. However, he is willing to submit if he feels his own importance and feels the support of his colleagues. Libra-Dog does not build ambitious plans, can become a good assistant manager. For him the main thing: to find his vocation, and not a high position with a large salary. The man of this zodiac sign combines the diplomatic talent of Libra and the fighting qualities of the Dog. Able to peacefully resolve any conflict, but will fiercely fight for justice. Libra-Dog — intelligent, thinking man, a professional in his business. Colleagues pay tribute to his diligence, he is more concerned about the interests of the whole team than he thinks about himself. But this is a rather contradictory nature, so altruism peacefully neighbors with selfishness. Women in love with him rely on the devotion that is characteristic of the people of the sign Dog, but it is in personal relationships that he demonstrates freedom of love. Excessive care worries him, while he wants to feel needed and loved. But he always cares about close people, regardless of his attitude towards them. Libra-Dog woman can live a happy life, but for this it needs to find a balance, decide on their desires. Too often ignores her inner needs. She likes funny companies, communication, wants to take place in the profession. Instead, she diligently searches for a reliable support in the person of a serious man, for which she is ready to sacrifice her interests. Although family life with a chosen one may not be as good as she imagined. But under any circumstances will not give up her plans, so she will try to keep the marriage in all possible ways. It’s a loving mother and a good housewife. Easily combines care for the family with work, in difficult situations, it earns a responsible approach to life and a rare diligence.